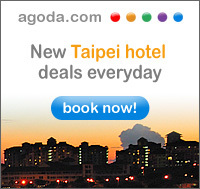 We would leave for Kaoshiung and continue our journey toward the north. Maobitou Park was our last stop for our visit in Kenting National Park. This park is also one of the most visit spots in the park. The entire national park is formed by massive coral reefs for millions of years. Maobitou is due to fallen coral reefs which has formed a shape like a crouching cat looking at the ocean. Hence, local residents named itMaobitou which Mao means Cat and Bitou means nose head. Vendors sell all kinds of merchandises near the parking lots. This look out area is the best place to see the shape of the crouching cat. 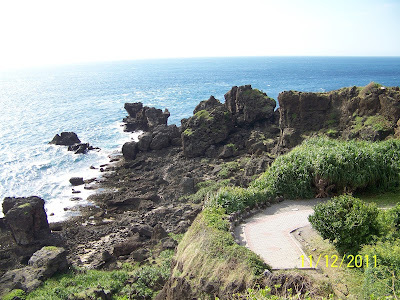 Also it is at the border of the Bashi Straits and the Taiwan Straits. This view was taken from the look out area. Do you see any cat there? Sometime you have to use your imagination to see the image in the rocks. I like to see the wave hitting the rocks rather than image or count how many cat-lik rocks are sitting there. As we left Kenting, we stopped at one of two fresh fruit shops which major customers were Chinese tourists for tasting various local fruits and purchasing them. After you bought the fruit, the shop employees would peel the fruit for you. Our travel distance was 110 KM about 2 hours and 50 mins drive to Chijen, Kaohsiung. Arriving in Chijen it was about lunch time. Chijen is famous for its seafood. Our driver took us to his favor and reasonable seafood restaurant. It was near a fishing port and only locals knew the restaurant. This dish was very fresh and tasty. 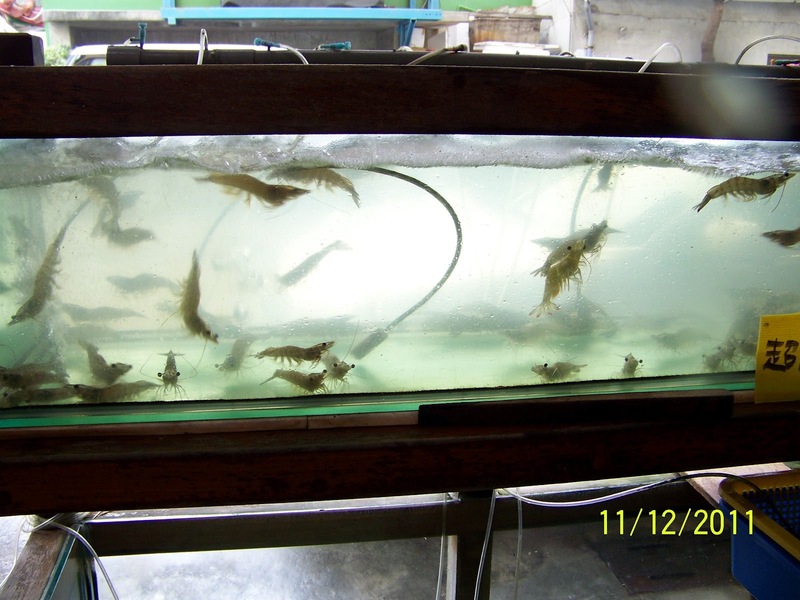 The shrimp tank displayed in the front of the restaurant. This was our leftovers. 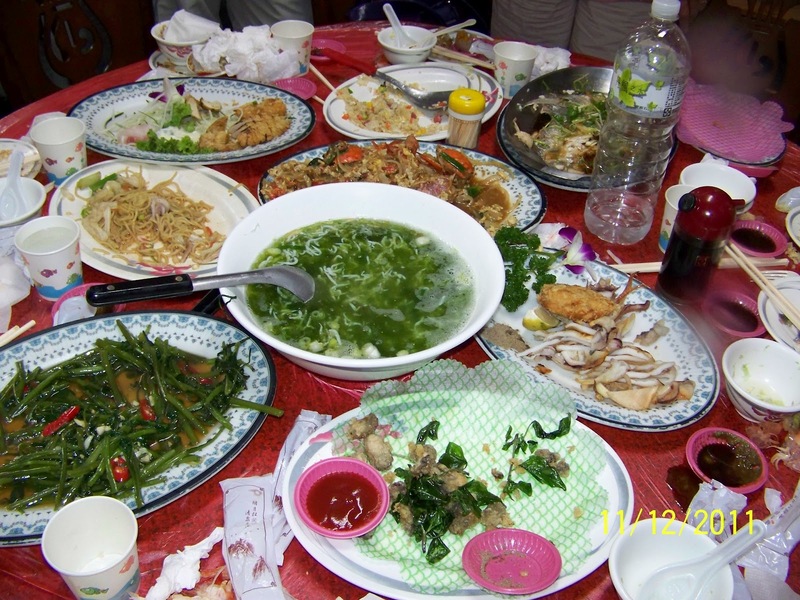 We felt guilty for wasting so much food. At the same time, I spotted the restaurant employees already standing by our table with some plastic bags. I knew they were waiting for us to leave and they would take the leftovers home. That made me felt better. After lunch, we planned to visit the historical site, Qihou Fort on the top of the hill which was an important location for guarding the city of Kaohsiung since the 19th century. It was built in 1875 by a British engineer. Our driver dropped off us at the nearby park and then drove through the tunnel under the harbor and would pick us up at the other side of the harbor at the ferry. We walked through many old banyan trees. Their extent overhanging roots and branches combining with overgrowing grasses created a sort of spooky feeling. 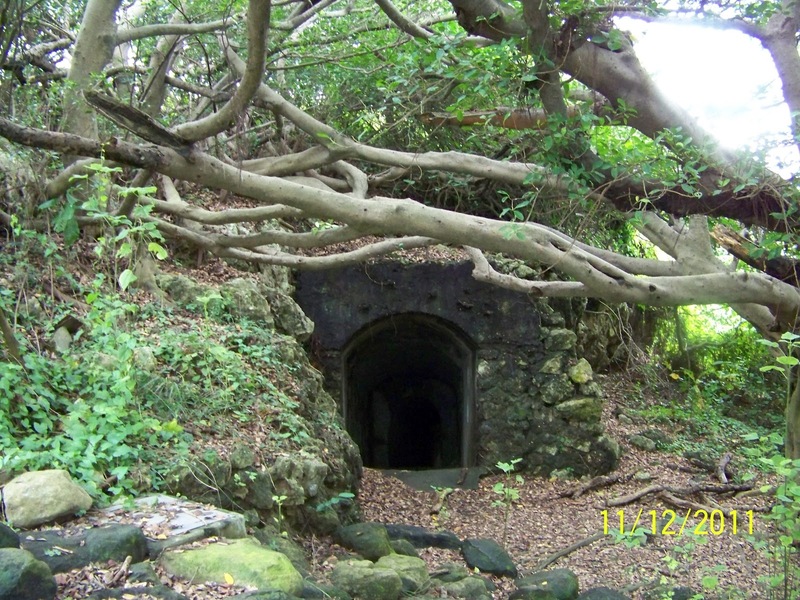 There were many tunnels and pillboxes along the trail which showed its importance for national defense purposes in the past. There were some interpretative signs of the history along the walls. We stood on the top of the fort and overlooked the Kaohsiung harbor and city. 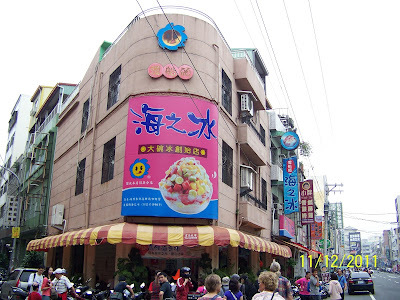 The building on the right side is called Building 85 which is the tallest building in Kaohsiung. Overlooking the beach and where we had started walking from. Qihou Light House was built by a British engineer in 1887 after the Second Opium War which Qing Dynasty had lost and signed treaties to open up Kaohsiung, Tamshui, Keelung, and Anpin sea ports to the western countries. It was reconstructed in 1914 by the Japanese government due to the expansion of the Kaohsiung harbor. 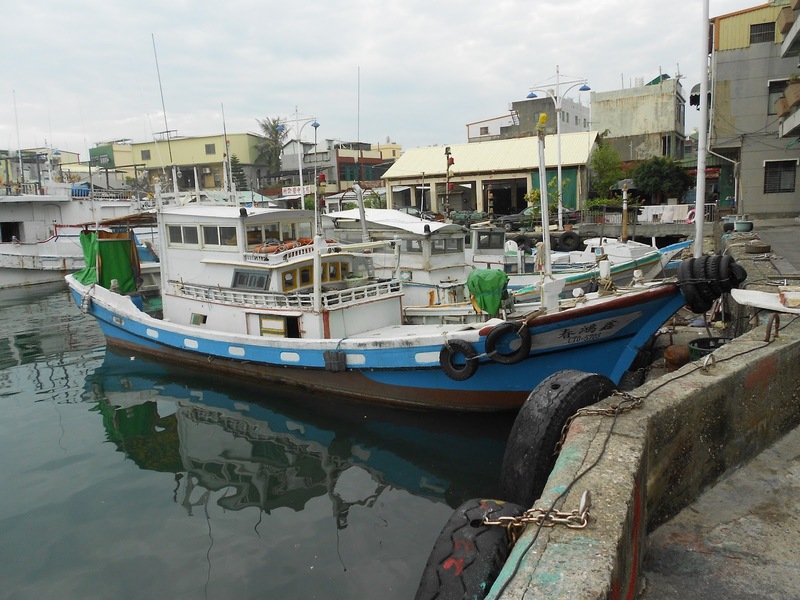 It offers great birdseye views of the Kaohsiung city and harbor. 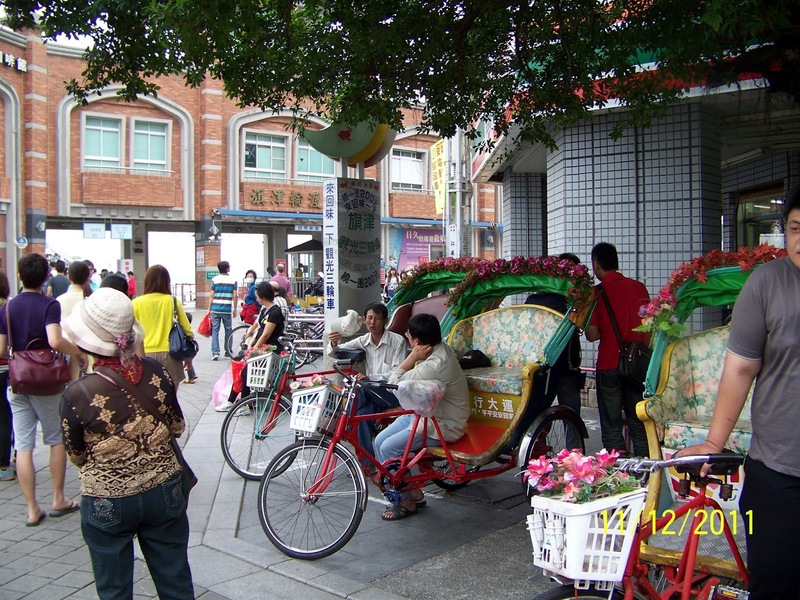 Pedicabs were very popular in Chijen area in the 70-90'. But now the business is almost gone and only tourists use them when visiting the island. It was time for us to take the fairy across the harbor and say goodbye to Chijen. It was a short ride to the other side. Also you can take your motor scooter or bicycle on board and pay a small fee to cross. 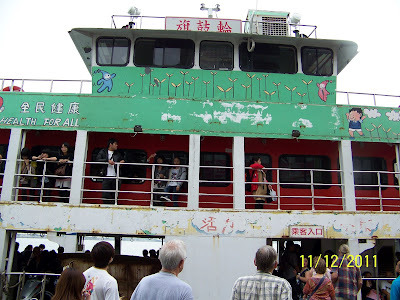 It costs NT$15 per person for the ferry ride. After a short walk, we went for our dessert treat. This store sold shaved ice topping with fresh seasonal fruits. It was very famous and just outside of the Gushan Ferry Pier area. Even though it was in November, it was still warm in Kaohsiung. There were a lot of people waiting in line for the icy desserts. Of course we didn't miss it. After having the dessert, our driver picked us up and took us to our hotel. Our hotel rooms were upgraded to executive suites. Everyone was very surprised and happy with the hotel facilities. It was early and the warm humid weather made everyone looked tired, so we decided to take a two hour rest in the hotel. 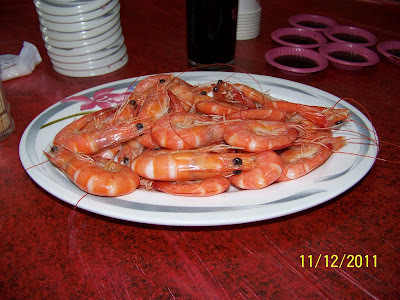 For our supper, we were going to experience and taste food at the famous Liuhe night market. 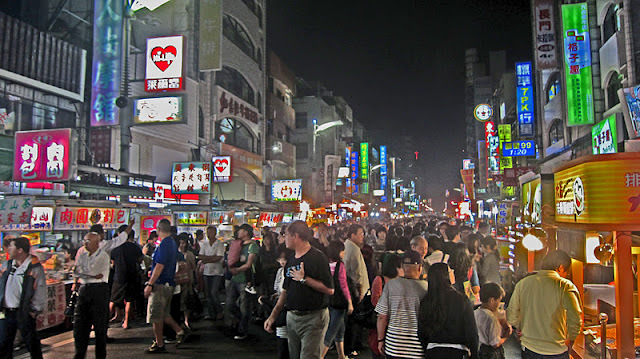 Liuhe night market was only 380 meters long but it had 170 booths and stores along the street. It was well known internationally. You could see the visitors from Japan, Singapore, China etc. There were several famous food stands; however, they might not be accepted by the westerners. I encouraged my friends to have Stinky Doufu but the smell scared them away. My friends were having BBQ Chicken on the stick. It was delicious for them. I had my traditional Taiwanese deep fried fish noodles. 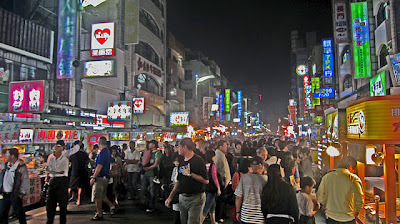 There were a lot of people in the night market. Every one was looking for her or his targets. 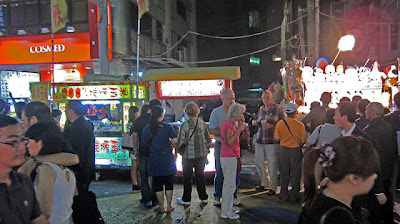 Eating in the night market was very economical for travelers and also a way to learn and understand Taiwanese culture.